Dreams fascinate us, dreams frighten us. Some dreams may eventually lead to the destruction of any human mind, bringing nightmares into full reality. In J.D. Kaplan’s fast paced sci-fi fantasy Waking Dreams, readers are thrust between two dimensions; the world where we dream and the world where we awaken. With plenty of mystery and edge-of-your-seat moments, one grieving man must fight an evil, otherworldy force who is determined to break down the very wall that separates dreams from a wakeful world. How long have you been writing and what initially got you interested in it? As a child I was a voracious reader. An aunt introduced me to the joys of science fiction and fantasy in equal parts. For my 12th birthday she sent me Dune, The Hobbit and Lord Foul’s Bane. I loved the stories, the escape and the magic of it all and before I reached 13 I had written my first novel–the worst 200 pages ever put to paper. That story has long since been lost in the mists of time and that’s a good thing, but I still look back in amazement that I was able to get the words down at all. Can you give us a quick introduction to your novel? What is it about? Waking Dreams is a story of a man whose dreams sometimes come true. He dreams that he loses his wife and youngest daughter in a plane crash and when it comes to pass he is plunged into a crippling depression. 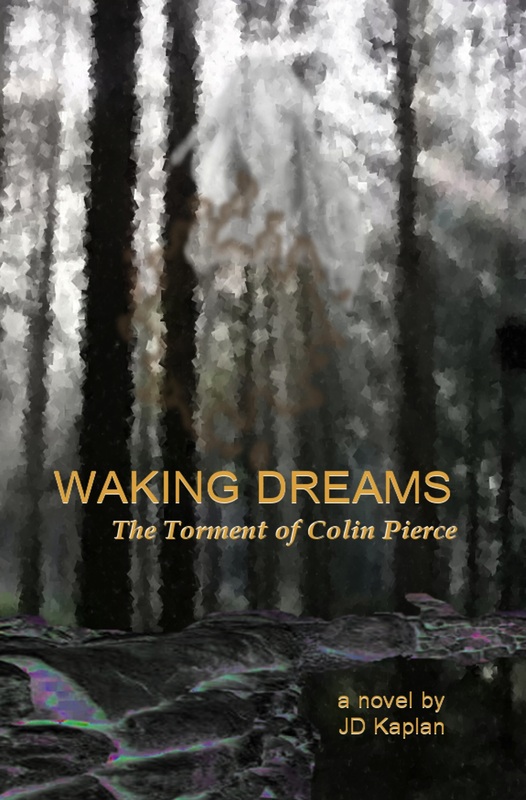 The story is about how Colin discovers another world, tightly tied to our own, where all dreaming takes place. This world is in grave danger and it is up to Colin along with his surviving daughter, Sidney, and their strange and mysterious neighbor Penny to save this other world from a horrible nightmare. Your novel is about dreams–a subject I really enjoy, by the way. How did dreams play into your creative process? Most of the action in Waking Dreams takes place in a place you refer to as the Dreamside. What is that? The Dreamside is the world we visit when we dream. It is chaotic and often illogical–anything is possible on the Dreamside. It is a reflection of what people dream. Some of the dreams are extremely transient–rippling realities created by a dreamer yet gone as soon as they wake up. Some dreams are stronger and create places persist, making up the larger part of the dreamscape. The Dreamside is separated from the waking world by the Wall of Sleep–the Wall is a concept that manifests itself in many ways. Sometimes a beautiful woman, sometimes a brick wall separating grasses meadows and sometimes just the hint of an idea on the edge of our consciousness. But we all recognize the Wall when we meet her–she is a mother, a friend, a shepherd to each dreamer. She is central to the conflict of the story as she represents a key part of the interlocked worlds. If our dreams and nightmares could cross that line at will, the waking world would be filled with the horrors and wonders we dream. And as humans need sleep and dreams to maintain their sanity, if there were no longer a place to dream, what would become of us as a species? Who was your favorite character to write in the novel? That’s a difficult question. Colin and Sidney are people with lots of depth and it was great fun to work with them–they grew in ways I really didn’t expect. But Penny is my favorite. She is such a conundrum–sometimes flighty and innocent and other times wise and powerful. The way she interacts with people was really fun to write. Tell us where Tayport, Illinois is and the significance of it. Tayport exists in my mind entirely. I have never lived in a large city like Chicago or New York. While I spend time in Chicago quite often I really don’t know what it feels like to live there–the subtleties and nuances of life. So I decided to create a city nearby that I could own and build as I wished. It’s something I learned by reading Charles de Lint. He created his own city called Newford where most of his books and stories take place. He’s been able to create and grow that place through out his career and it has such depth and imagination–something that would be hard to manage in a city you didn’t actually live in. When you’ve got the premise nailed down, where do you get your ideas from as the story plays out? Most of it happens when I’m running or when I’m driving in my car listening to really loud music. I like to imagine a scene, sometimes the ideas come out of how the music behaves lyrically and the shape of the sounds. More often it’s just that the music generates such an emotional reaction that my imagination is nudged and I go into a creative mode that is often hard to just kickstart on demand. Waking Dreams started as I imagined what it might feel like to burn in a fire. I was listening to a song by a band I love and one phrase in the song struck me and I found myself imagining the house fire scene in Waking Dreams. I know that’s dark and negative but it quickly grew into so much more than that. What would it be like if dreams like that came true–what would the consequences be in the real world? Those questions set me on the path that ended up in the Dreamside. You chose the self-publishing route. What are the advantages of doing such in this tough market? One of the advantages is that it’s all on me to get it done. I retain complete control of the work and my creative schedule and process. It’s a lot of work but has been really rewarding. The Internet has exploded the world of publishing. I find myself wondering what traditional publishing houses think about the whole situation. I was able to put my book out not only in the various electronic formats but Amazon provides a publish on demand service called Createspace that allowed me to get it into trade paperback format, readily available not only on Amazon but through Ingram’s distributors. This means that you can go into any bookstore and special order it. The hard part is all the marketing and selling I’ve had to do. I’m a writer and a reader and sales, marketing and self promotion are skills that are so far from what I do well that it’s a constant struggle. But interested people are out there and they are reachable and figuring out ways to find those people has been a wonderful experience. What is the hardest part of writing a novel, once that first chapter is in place? Maintaining the habit and tying all the details together so that the story as a whole gets finished and when it’s done it holds up as a whole. Fighting writer’s block is inevitable and like any other discipline you have to really focus on making sure you write everyday. When I first started writing Waking Dreams I had been away from writing for several years, focused on a band I was in and my budding career as a software developer. I had a lot of trepidation about the length of a novel vs the short fiction and poetry I had been doing. At first it was work. But as things began to flow along it became pleasurable. You have to have process you use to face any situation you find yourself in; writer’s block, unsure of the progression of the plot, etc. And you have to have the openness to throw those tools aside when needed. What genres do you enjoy reading? I love contemporary fantasy, urban fantasy–that’s a guilty pleasure. But I also love epic fantasy, hard science fiction and my other guilty pleasure is space operas. I don’t mind a dose of romance and a little explicitness in a book but prefer to avoid erotica if I can help it. I am really in love with strong female main characters. There’s something really engaging about these characters. I also enjoy stories where the main character is not all powerful, or at least grows into some kind of power. Will there be more stories about Colin and the Dreamside? Yes, definitely. He makes a brief appearance in my next book and I already have begun storyboarding a novel that features all of the characters from Waking Dreams.